In addition to following the American Heart Association’s (AHA) heart healthy diet recommendations (low-fat, high fiber diet with fruits and vegetables and plant-based protein), the DASH diet emphasizes a low sodium diet with adequate amounts of calcium, potassium and magnesium. This plan has been shown to lower blood pressure in as quickly as two weeks. 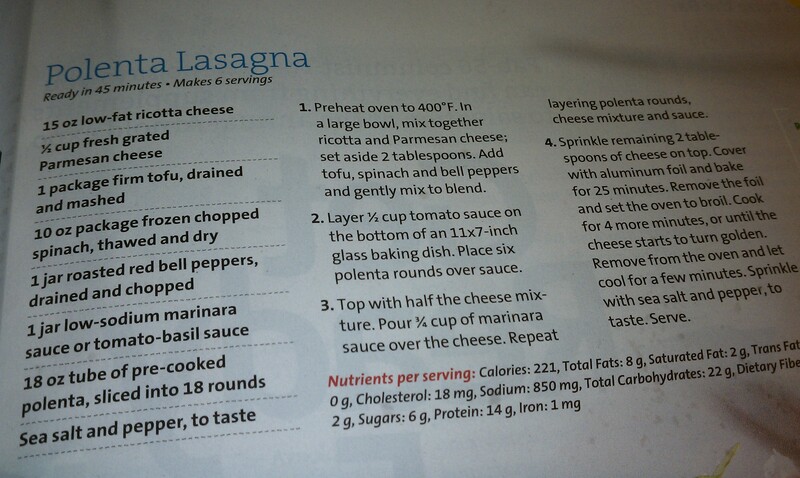 Following this plan may also lower LDL (bad) cholesterol. Reducing your sodium intake is extremely important to lowering blood pressure, but the following nutrients have also been shown to play a role. Focus on eating a variety of fruits and vegetables daily (5 to 9 servings per day) as well as the other nutrient-dense foods below. 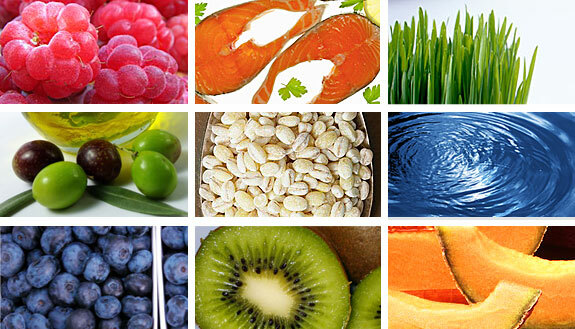 For more information visit the DASH Diet. Place ¼ cup cereal in a small bowl; layer 3oz yogurt, ¼ banana, 1/16 cup almonds, ½ Tbsp apricots. Repeat. 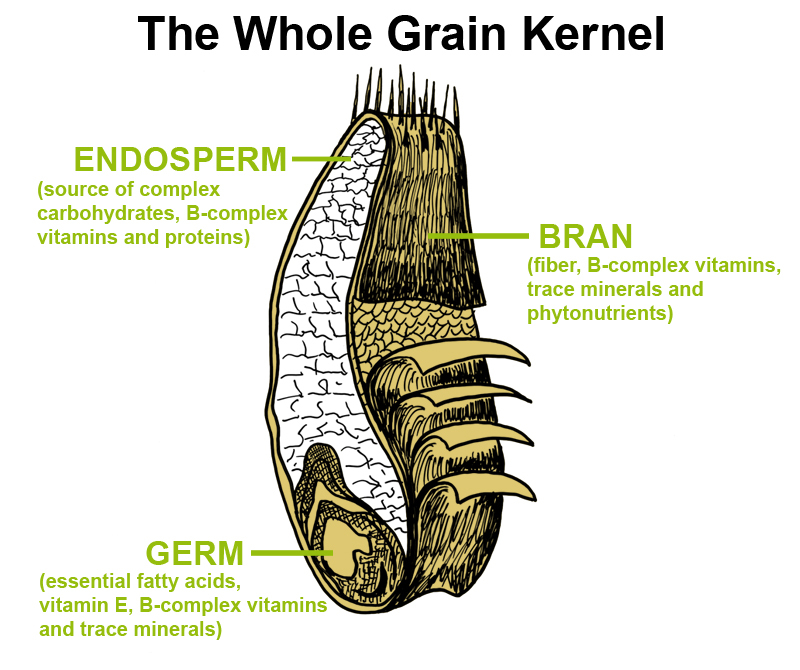 When grains are processed to become refined carbohydrates, the bran and germ are removed, removing the nutritive portion of the grain, leaving only the energy providing portion. Whole grains provide essential nutrients that processed grains do not: fiber, vitamins (thiamin, riboflavin, niacin, folate) and minerals (iron, selenium [an antioxidant], magnesium). The USDA recommends you eat half of your starch servings as whole grains. I say, why waste calories on foods that don’t provide any health benefits [energy dense] when you can be providing your body with essential nutrients with every bite [nutrient dense]. In other words, I recommend ALWAYS chosing brown rice or quinoa over white. 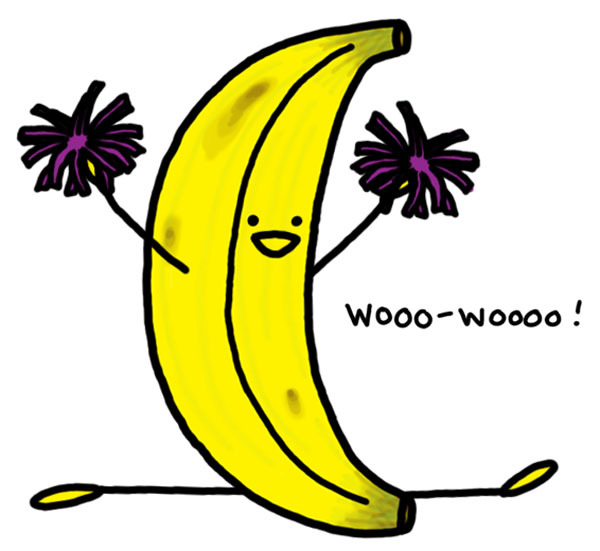 When increasing your fiber intake, remember to increase gradually to avoid GI distress and drink plenty of fluids to keep your bowels regular! March is National Nutrition Month, a campaign sponsored by the American Dietetic Association to promote nutrition education; this year’s theme is Eat Right with Color. As a dietitian, I am often asked about multivitamins. My personal recommendation, however, is to obtain nutrients from eating a variety of whole foods as research is yet to conclude if supplementation has the same benefits as obtaining these nutrients through the diet. Each day and week, think about including fruits and vegetables from all color families to provide your body with a rainbow of vitamins, minerals and antioxidants, substances that protect the cells in your body. Aim for at least three different colors at each meal to obtain maximal health benefits. Blue/purple: Anthocyanins, found in blueberries, black rice, red cabbage and cherries, are antioxidants which are touted to decrease inflammation associated with arthritis and heart disease. These foods also contain resveratrol, an antioxidant specifically linked to protecting against heart disease and maintaining eye health. Anthocyanins also contain anti-aging properties, may help with memory and promote urinary tract health. Blueberries, likely because of the anthocyanins, have been shown to improve insulin sensitivity and lower blood pressure. Red: Red foods such as tomatoes, beets, watermelon and pomegranates contain lycopene, an antioxidant that in men with high intakes was linked with decreased risk of prostate cancer. These antioxidants also protect us from heart disease and may benefit those with exercise-induced asthma. Green: Kale, spinach, broccoli, avocados and asparagus are nutritional powerhouses that are rich in lutein for eye health and vitamin K for bone health. Green fruits and vegetables are also good sources of vitamin C, folate, and magnesium. Orange/Yellow: Sweet potatoes, carrots, pumpkin, and apricots contain a variety of carotenoids, which enhance immune function. Carotenoid-rich fruits and vegetables (not supplements) have been shown to possibly reduce the risk of cardiovascular disease and cancer. Orange and yellow foods are also high in vitamin A to help protect the eyes and are thought to fend off colds by boosting immunity. White: The lack of color in these foods is not for lack of nutrition! Potatoes are high in potassium, an electrolyte that helps lower blood pressure, and vitamin C for immunity. Cauliflower, potatoes and mushrooms contain allicin and quercetin, substances that may defend against cancer and inflammation leading to heart disease. Red onions contain several types of antioxidants including quercetin. Onions and garlic are beneficial to the cardiovascular and immune systems and may also have anti-cancer effects as well. Brown: The brown group not only contain produce such as dates, but also whole grains including wheat, brown rice and wild rice are good sources of fiber to aid with weight management, maintain gut integrity and control blood sugars. 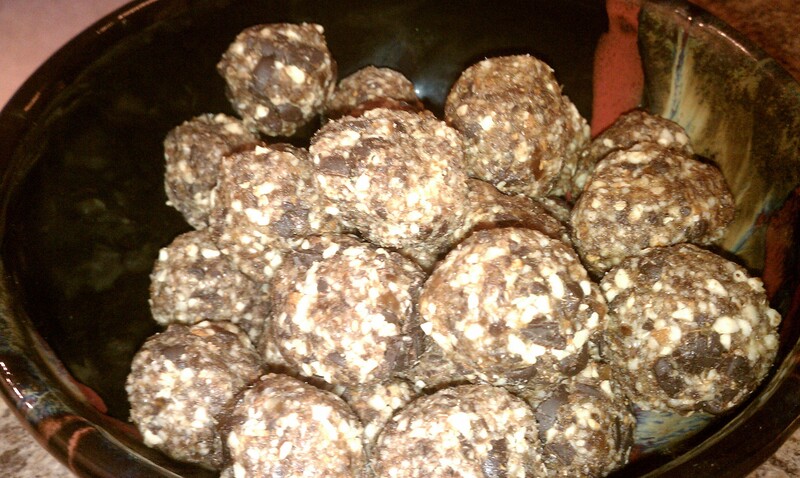 They are also packed with B vitamins and iron to keep you energized. Almonds contain heart healthy monounsaturated fats and vitamin E, an antioxidant. Add spinach to your fruit smoothies – you won’t even be able to taste it! Add a spring mix salad topped with colorful bell peppers and red onion as an appetizer to any meal. Mix fresh berries into your morning oatmeal. Pack cut-up carrots to eat with lunch or a snack. Make a homemade soup with pureed or chopped vegetables including celery, carrots, potatoes and peas. Or add extra vegetables to low-sodium, canned soups. Each week or month, find a recipe for a fruit or vegetable that you haven’t tried before. How do you add color to your diet? “I continue to stand by my initial statement that the HCG diet is one of the worst diets I’ve ever seen. Part of my role as a registered dietitian is to evaluate available research and the authenticity of data on various topics, including fad diets such as this. The original HCG diet restricts total calories to 500 per day, equally divided into 2 meals. Each meal can contain roughly 3.5 ounces (100 gm) of lean meat, one serving each of a specified fruit and vegetable and one breadstick or Melba toast. It’s relatively easy to see that this diet is deficient not only in calories, but vital nutrients including protein and fat, entire food groups, vitamins, and minerals! The minimum diet of around 20 days is more than enough time to develop nutrient deficiencies. Even taking a multivitamin doesn’t guarantee health assurance; studies have shown that the whole food is more important than the sum of its parts. This is a semi-starvation diet and doesn’t provide adequate calories to support normal brain function or muscle store of glucose. Such calorie restrictions can trigger the body to significantly slow the metabolism in an effort to conserve calories to survive. The body will very quickly begin breaking down muscle as a source of energy. Keep in mind that your heart is a muscle. Semi-starvation also affects hormone and electrolytes in the body. An Imbalance of electrolytes can have serious side effects including heart arrhythmias, come and sudden death. A number of randomized controlled trials have been conducted on HCG and weight loss. The double-blinded, placebo controlled trials are strong designs because neither the researcher nor the participant knows which drug is given. Randomization mimics “chance”. Both of these factors limit bias. These studies demonstrate no significant difference in weight loss between the participants who received the 500 calorie diet and the HCG injections or the 500 calorie diet and the placebo injection. Placebos are look-alikes used to protect studies against bias. Researchers concluded that the significant weight loss seen in BOTH the participants who received the HCG AND the placebo injection was attributed to the drastically low calorie diet. Essentially, this has been shown to be a very expensive placebo. HCG has been approved by the FDA for use as a fertility drug; it has NOT been approved as a weight loss agent. In fact the Federal Trade Commission, an independent government agency that investigates and protects against deceptive and fraudulent claims, ordered the clinics that offer this program to post the following statement: HCG has not been demonstrated to be effective adjunctive therapy in the treatment of obesity. There is no substantial evidence that it increases weight loss beyond that resulting from caloric restriction, that it causes a more attractive or “normal” distribution of fat, or that it decreases the hunger and discomfort associated with calorie-restricted diets. In summary, even medically managed, inpatient weight loss programs do not restrict calories to this extent nor do they use hormones whose long term effects are unknown. They do, however, have an MD or DO monitoring vital signs and blood values daily and a dietitian ensuring a balanced diet. I hope that I can at least enlighten the public to consider the obvious way to a healthy weight – small lifestyle changes that make a big difference – and to quit looking for quick fixes to “get skinny.” There is NO quick fix diet or pill that will result in lasting health. 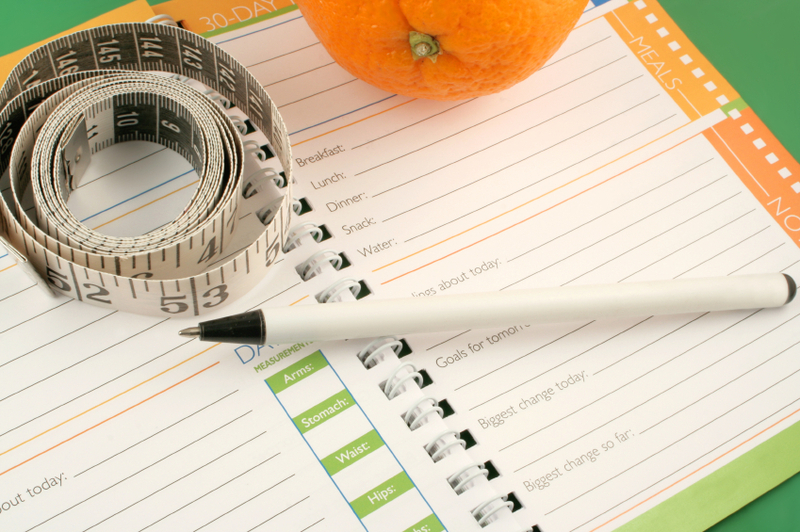 So why on Earth would you waste your time with these fad diets? In half the amount of time you could have changed your life and gotten on the road to being healthy at a normal weight for the rest of your life. 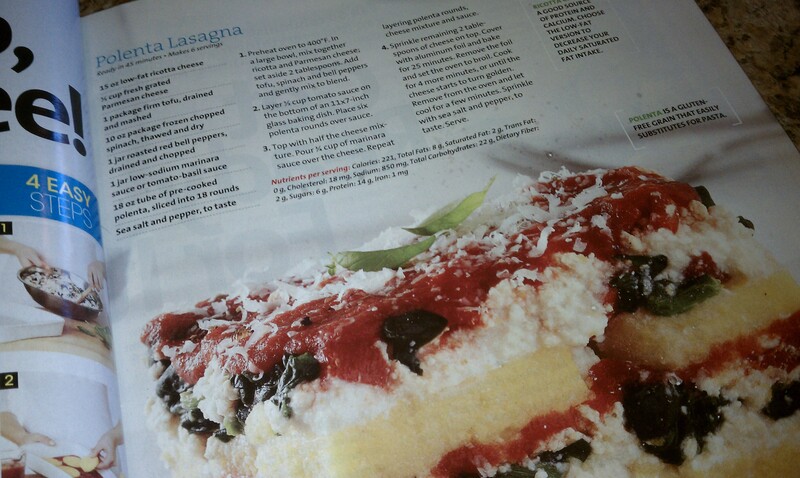 In honor of Meatless Monday, I’m sharing a DE-LISH vegetarian recipe I’ve tried from Oxygen magazine – Polenta Lasagna. I love Oxygen! It always has great “clean” recipes, and good workout tips and motivational articles also. Even better, they have registered dietitians on staff! This was actually my first time using polenta, which is cornmeal simmered in water. Polenta is a (gluten-free) whole grain and is a good source of protein and many vitamins and minerals including vitamin A [good for your eyes and cells], potassium [helps to lower blood pressure] and calcium [necessary for bone health and used in muscle contractions]. It was traditionally eaten at breakfast, but is very versatile and often used instead of pasta! My own photos didn’t turn out too well – we were starving and dug in before it had much time to sit and cool so it pretty much just fell apart on the plate! As messy as it looked, it tasted wonderful – enjoy.